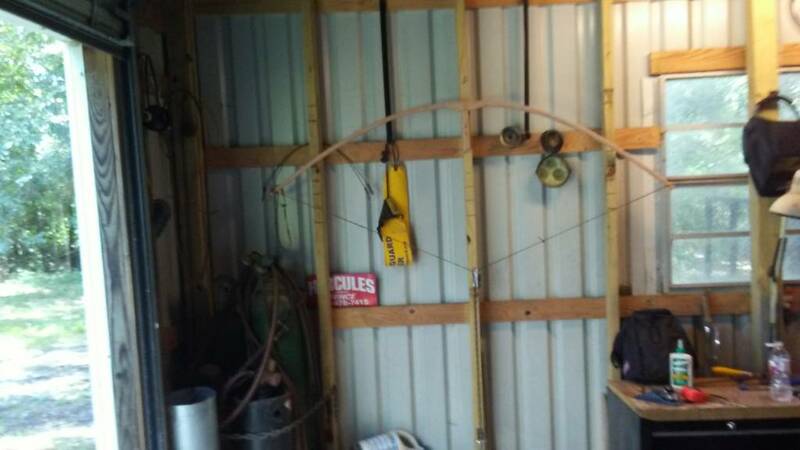 Building a Selfbow. If I back it with something besides wood is it still considered a selfbow? What can I back it with to increase the draw weight considerably? Its red oak and feels like 30#s, would like at least. 45. 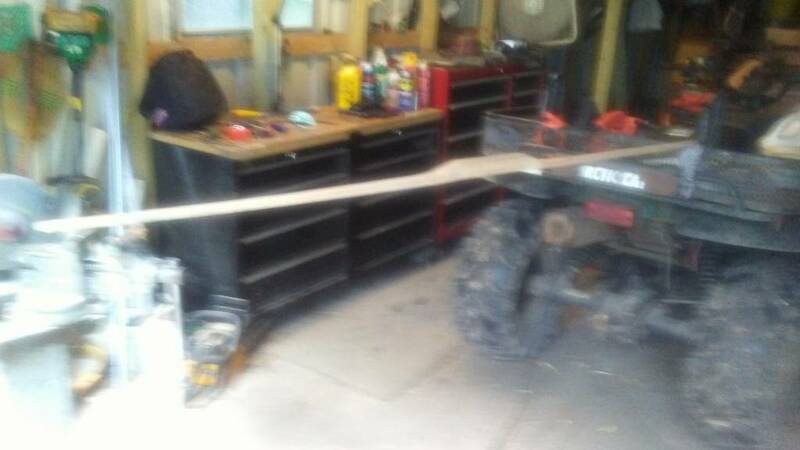 Its 72" long, how much could I shorten it to get it to around 45? Also if I put fiberglass resin on it to hold the backing will it still be a Selfbow ( in tbot rules )? Any man made materials makes it a longbow, not a selfbow. Adding wood or bamboo to the limbs makes it a composite. Shortening it will get you more weight but I seriously doubt #15. Backings must be of animal parts for tbot. The only backing to add poundage would be sinew. Red oak is poor in compression so it will crush with a weight adding backing. Best to cut it down. To add fifteen pounds I would only cut it 3/4” max on each end. That will probably be too much but you can shave weight off slowly to get what you want. Also red oak takes loads of set so it may be best to end up a little heavy. I would back a red oak board with raw hide to save your noggin. Kiln dried oak is unpredictable but not impossible to get a good shooter out of. I have one I backed with linen four years ago and it shoots great, just ain’t the prettiest of things. Good luck to you sir! Also exercise those limbs before putting it on the tiller tree each time. I found if you don’t, you can finish it out at a certain weight and it will lose weight fast with first fifty shots or so. Is this your first selfbow? If so, leave it the weight it is tillering at, finish it, and build another bow. Don't get too hung up on hitting a certain weight until you have built a few that hold together. Good luck, building bows is a lot of fun and I miss it. Well back to the lumber pile. Lol Tried to draw it to 31" before I cut it down. Yeah it was my first try so I'm not surprised nor too disappointed. Next time I'll do better. You have a 31” DL??? That’s a pretty serious hinge right there! 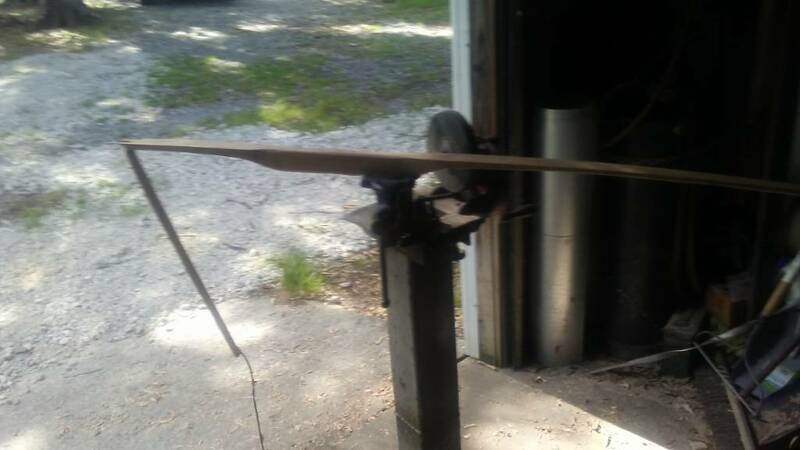 Naw Bisch, I was gonna shorten the bow to try for more draw weight but pulled it to 31" first which I figured would be about equal to 29 after I shortened it. Didn't work! If you ain’t breakin you ain’t making! Boards must be perfect. Find you a hickory stave. No ring chasing, just pull off the bark and that’s your bow back. Just keep it dry, hickory soaks up all the moisture in the air. 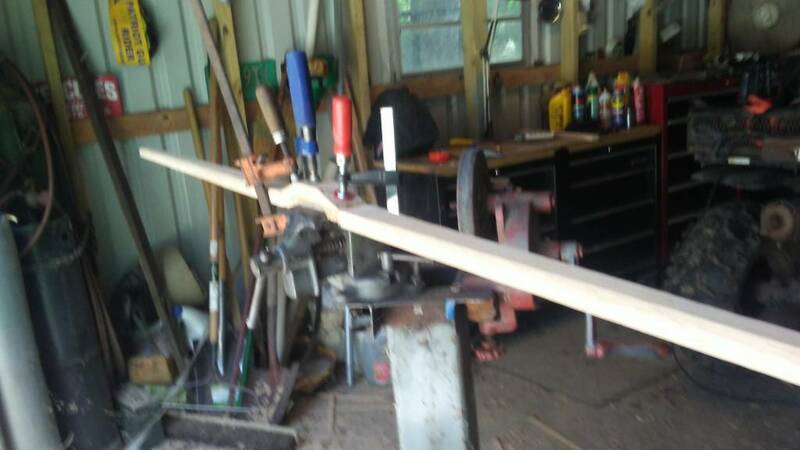 And if you have a 31” draw, leave all wood bows as long as possible. 72” would be a minimum on anything other than Osage. Even Osage would be best the longer it is. Sorry we posted at the same time. You would be amazed at how much weight shortening a bow puts on. By drawing it further your just drawing the same length lever further. Thanks Ken, I need all the advice I can get. I'm just glad it was just a 9 dollar board. How'd ole dad say " ya knocked me down and skin my chin but you son of a gun I'll try ya again"
I don't know Dog, I'd give you odds that it breaks too. I think I'll try some maple if it does. They got it at the lumber yard. but the only way I can recognize it is when it's bearing oranges. Ill keep an eye out now though. How are the growth rings positioned in the board? More importantly, the last board? They ran from one corner to the other diagonally on the ends and ran what looked like to me straight down the length of the board. I looked at least 30 boards before I found 3 that looked right. Of course I have no experience, just what I've read. All 3 looked that way. How can I prevent string follow without backing the bow? Presuming I make one that doesn't break. Man, if I knew that answer, I’d use red oak more often. I’ve left em wide and thin, narrow and thick, and exercised the limbs extremely slowly while tillering slowly. They take set. I think it’s something about kiln dried lumber. Or maybe just oak. I’ve never tried heat treatment or heating reflex. I just could see that making it it more prone to breaking. I’ve often wondered about a Z splice in the handle like I would with Osage billets. Joining them with glued in reflex. Then again, if I’m gonna go through that much trouble, I’ll just get some Osage billets. Even if your bow takes set, it’s ok. Especially your first. They still shoot good. Just don’t have the cast it would have without it. Most importantly, don’t draw the bow past the weight you want when tillering. That will minimize it. Red oak is tough. You have to go slow. 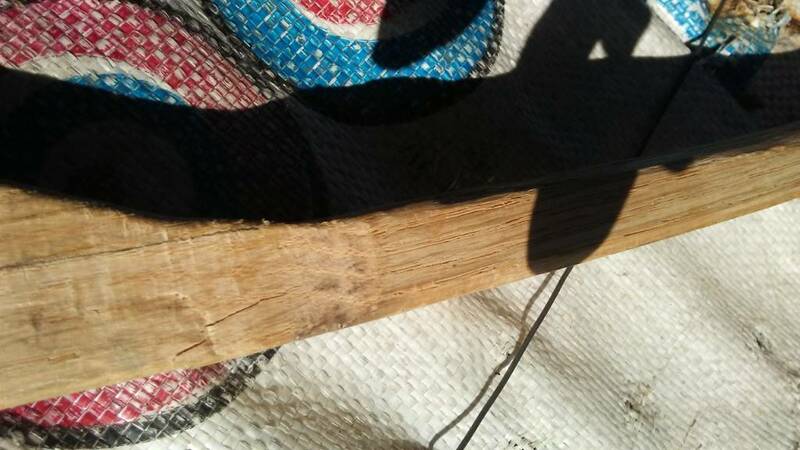 I know a lot of places suggest board bows for beginners because they are cheap, but I know a lot of red oak board bows that ended up on the scrap pile by first time bowyers, while when we started guys with osage or quality hickory they got shooters. Maybe not pretty but shooters haha. I have actually never had a selfbow break but I think that's luck not skill. Maybe post some pics of your tiller as you go and I am sure someone here can offer advice. Best thing I learned early was take a short piece of wood (I think 5-6" was what I used to use) and slide it along the bent limbs. Any flat spots show themselves immediately. Those are the areas that will get crysaling, hinges, break, etc. Well I tillered it until it was getting below 40# so I quit. Not real bad I don't guess. I shot it a couple of dozen times and it did pretty good. Little bit of hand shock but not bad at all. THEN, I noticed this. Like Ken said, if I ain't breakin, I ain't makin! Tiller was really even. Notice how flat the upper limbs were. Meaning most of your bend was at the fades. Just so happens that’s where the crack ended up. If you get another one, think arch. Even flex through out the limbs. Please don’t think I’m criticizing your work, just adding suggestions. Also try to round the edges off smooth and remove the deeper tool marks before bending her too much. You may have, I just couldn’t tell from the pics. Didn't take anything as criticism, I really appreciate you giving me information. Whole lot better learning from you than by my bad experiences. I think I'll get some maple to try next, from what I read it holds up a little better and costs very little more. Around here maple is a little hard to find. I’d like to try it one time. I just let my lease go other side of Menard. Usually go through Llano a dozen times a year. Probably go through there a few times this year. If I do I'll bring you some maple 1 x 2's. That is if I can find something decent. Was there a few weeks ago. Wife got an offer at the hospital but she didn't find any place she liked. Not many homes for sale around there. Think circle ...it looks like you are ONLY bending in the fades and not hardly bending anywhere else...one trick is to take a pictire and then use a quarter as a guide..so scrape scrapescrape.check tiller ..take the pic and check that against the quarter..the limbs should follow the edge of the quarter ...clear as mid...and make a tillering gizmo (thats the name of it),, google that...that little tool will help. At the risk of sounding like a dumbs#:, what are the fades? I mean it seems to me that the "fades " would be the taper. I tapered this one from the grip all the way to the ends. Where the riser fades into the limbs. There is a ton of info on youtube ...and many sites devoted to selfbows ..primitive archer comes to mind but there are many others. Last edited by Selfbowman; 06-08-2018 at 05:30 AM. ...and make a tillering gizmo (thats the name of it),, google that...that little tool will help. I agree, that is why I suggested it earlier. We didn't call it a "gizmo" back in PA but I like that. It really works when new to building bows. Some people have a hard time seeing a bend vs a flat spot. Using that takes the guess work out. Selfbowman, did I meet you at the Shoot-Out? A man there told me about OJAM, was gonna meet him there but I lost my phone and his number.